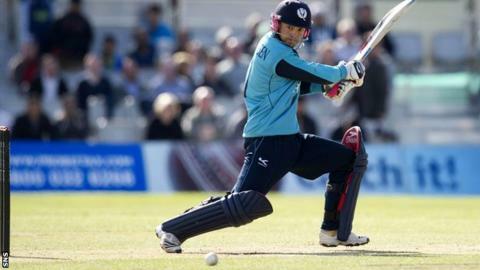 Scotland made a miserable start to their World Cup 2015 warm-up tour, suffering a 186-run hammering by Tasmania in their opening match. Former Scottish Saltires batsman Eddie Cowan did much of the damage as he hit a century for the home side. Freddie Coleman top-scored for the Scots with 28. The visitors have six more matches to play on tour as Grant Bradburn's outfit prepare for next year's World Cup in New Zealand. Scots skipper Preston Mommsen won the toss at the Kingston Twin Ovals on Monday and elected to field. Iain Wardlaw struck with 25 on the board, removing Beau Webster, but Alex Doolan's knock of 75 from 98 balls gave Tasmania a solid foundation. And Cowan built on that, with the left-hander registering his century from 106 balls before being dismissed when he clipped to Calum MacLeod at deep square leg. Jordan Silk hit 62 from only 39 balls and Mark Hill's 34 pushed the hosts past 300 to set the visitors a daunting target. Scottish openers Matthew Cross and MacLeod were dismissed by Timm van der Gugten with the score on 16. Hamish Gardiner and Majid Haq both hit 21 and Coleman reached 28, but the Scottish batsman struggled to handle the pace of Hamish Kingston and Van der Gugten, and then the spin of Clive Rose, as they were eventually bowled out for 117 in the 36th over. Scotland's next tour match is on Thursday against Tasmanian Tigers at Anzac Park in Hobart.